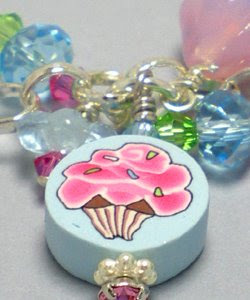 Here is a little teaser for you...just a hint of how the "Loaded Cupcake" polymer clay bracelet is progressing. There are lots of "doodads" in several colors so I'm working on it here & there in between several other projects but I'm going to focus on this one now because I don't want to drive you crazy waiting for it anymore! What kept me from it yesterday was a group of beautiful crystal bracelets that I just listed at my RockerJewlz shop on Etsy. I have 5 color schemes in sparkling Swarovski crystals and sterling and Bali silver in a piece you can wear elegantly with evening wear or toss on to dress up a pair of jeans. Below is the Beginnings bracelet in Royal Purple bracelet. This was the first design I ever assembled. My sis wanted it in the Garden version so she helped me figure out the placement of the beads. And you have a few days left to purchase everything on both my sites at 20% off...AND I'm shipping EVERYTHING (except custom orders) within a day until this Sunday, May 3rd to help you get what you want by Mother's Day...can't guarantee that since I'm not the post office, but at least on my end I'll be moving like lightning to make you happy. Until Sunday, May 3rd, ALL orders in my RockerJewlz jewelry shop and MomsArt paper shop are 20% off and will ship next day at the very latest (except custom orders). Most will ship same day. Remember this mystery bead from a few posts back? 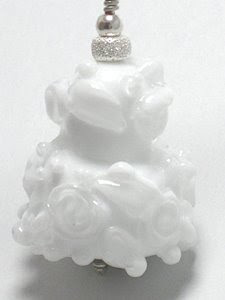 It's a wedding cake bead and I've turned it into the White Wedding Lampwork Pendant in my shop. I'm covering the shipping on this one so that even to you, the gift giver, it feels like a treat! It's a full, 3 dimensional sculpture of two tiers of perfectly white handcrafted glass covered in luscious swirls and scrolls of frosting. It's a little over 3/4 of an inch (22mm) and is simply spectacular. 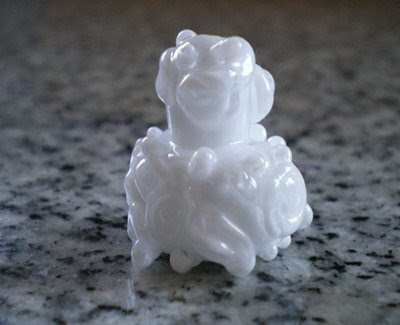 Above is one view and below is the other view to show you it's personality that changes slightly as you move the bead. Sterling silver is the only other "ingredient" in this sweet piece with a subtle sparkle from the sterling stardust rondelle atop the cake and is suspended from an amazing Bali sterling bail in a heart pattern. The bail is small, but has a big opening. I left this as a pendant so that the gift giver can personalize the chain, cord or ribbon to fit the wedding theme and colors. Perfect for the "something new" gift for the bride. I just love it! 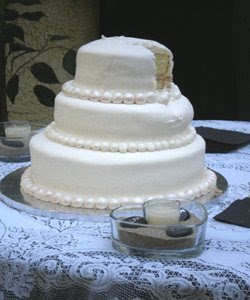 This leads me to my niece's wedding I attended on the 18th...below is her wedding cake that I photographed after the first slice was cut...and smeared all over the bride & groom's faces...hey, they are young. I didn't get a slice until the final bottom layer was cut and I was happily surprised by Red Velvet cake which I have NEVER had...I know, hard to believe, isn't it? It was chilled and had just a hint of raspberry & chocolate and the color was amazing. 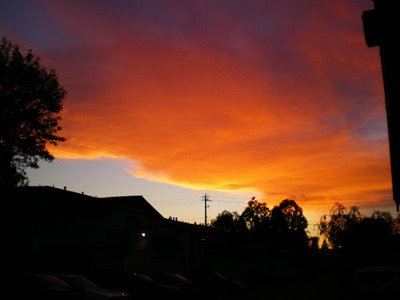 This topped off a fabulous meal of smoked tri-tip barbecie that fell apart beautifully. Never had tri-tip that good before. Thanks, Roddy and crew. The glass heart in front of the cake was the centerpiece for the dining tables. They had sand to hold a candle and 3 smooth black stones that each had white script words of love, hope & faith. I brought one home and am using the glass heart for special loose lampwork beads. It's fun to have it to remind me of this wonderful day. It just cracked me up when the limo arrived at the church with the bridal party and about 20 cameras were pulled out of purses & pockets to snap pics! I laughed so hard that I had to take a shot of the "paparazzi" swarm of family & friends ALL taking the same darned photo...as if no one could take pictures and then email them to each other....funny. 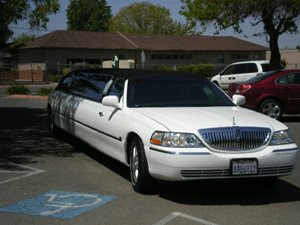 Great limo...shiny & clean and a perfect match for the black & white wedding theme. Even the chauffeur had totally white hair...now they didn't plan that...did they??? Thanks for your patience in waiting for this wedding bead to be revealed (Sandy, you can stop tapping your toes in anticipation now..haha) and I'm plugging away at the polymer clay cupcake bracelet...yum! Happy Friday! I didn't work as quickly as I'd planned this week, so the cupcake bracelet isn't finished, but I just had to show you my progress. 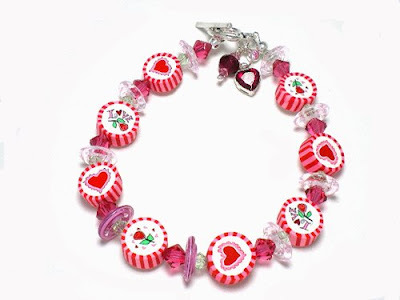 I'm loading up a bracelet with a bunch of cupcake charms like the ones you see above along with square beads, crystals, flowers and other goodies. It will be a nicely loaded, sweetly tinkly sounding joy to wear. And last but not least by any means are some super fun polymer clay beads in a beach theme that I am just itching to get at. I also have some strawberries & cherry beads to squeeze into the summer repertoire (among several other designs) but wanted to show you these to put a bit of summer in your day. 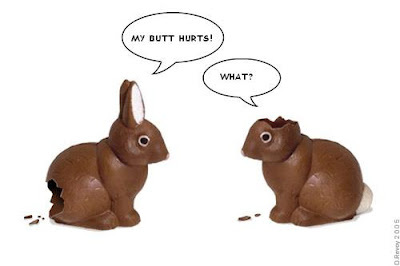 Be sure to visit my shops to enjoy the 20% off Easter sales on JEWELRY and PAPER crafts. Happy Weekend. Why, what's this??? A new pretty for you to gaze at and wonder about while I'm out of town for the weekend...didn't want you visiting without seeing something new that I'm working on. It's pretty, it's creamy smooth and it's amazing. I'll let you know next week what the heck I'm doing with it! Be sure to get your Cupcake jewelry for 20% off this weekend through Sunday night, April 19, midnight, Pacific time HERE at RockerJewlz's Etsy shop. So I told you I'm headed to my niece's wedding this weekend. Her mommy asked me to help out by picking up the wedding bouquet a couple of hours before the ceremony...how fun will it be to deliver those in person to my niece while she's getting ready with her wedding party?? What a hyper gab fest THAT will be! Tomorrow night is the rehearsal, then pizza for everyone so you KNOW I'm crashing that party. The wedding...very traditional and with a theme of black & white, very crisp. Bride and groom are in the Navy, she in California and he in Virginia. He's requested a transfer to the west coast to be toGETHer with his wife, so who knows how long the red tape will take. They didn't want to wait to be married...now that's love. My son is the best man and it will be lovely to see his handsome self in his tux once again which we bought for his 4 years in the high school wind symphony. He is 21 now so it's been a long time and he's a man in a tux, not a boy. A whole new experience for mom here. The tux still fits since he's remained wonderfully slender. Okay, I'm off, now get to your cupcake shopping! Reminder: Cupcake Sale is on through this Sunday, April 19th midnight Pacific Time. Oh my gosh, Monday's bracelet special (it sold in the first hour!) was such a big hit I have a whole new plan for spring. First, though, I have to apologize to those of you that receive my newsletter. Because of the verbage I chose in telling you about the "Love You" pinstripe bracelet, it was misconstrued by some as being a giveaway item instead of a specially priced item. So, I learned my lesson and will be more careful...because all spring long, specials are the features on this blog! I think just about everyone is looking for great bargains so for spring I'm focusing on polymer clay beads instead of the pricier lampwork glass beads I tend to work with. We all could use a fresh start, so this will help you get your Mother's Day gifts at a great price and not make you feel strapped for cash and it gives me a fresh outlook on style and components to work with. I just ordered a bunch of the most spectacular polymer clay beads with incredible detail that will be featured in these blog specials. The cupcakes above are just one example! I HAD to start with cupcakes, right??? A few hints of some of the other beads....soft yellow butterflies, blue hummingbirds, ladybugs and for all you princesses out there, one just for you... (and seriously, who isn't a princess?) 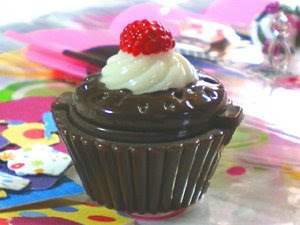 The beads are shipping today, so the cupcake special will be first up. I can hardly wait! AND if you have any CUSTOM requests, just let me know and I'll talk with the artist so we can do our utmost to make your dream jewelry come true. It's incredible when you have a vision and the artist makes it come alive...there is nothing like it! Just email me HERE. My niece who is in the navy is getting married this weekend, so you'll hear from me again when I share my excitement with you over receiving my bead package. Want to learn some fun little secrets about me? Check out this fabulous feature on me at Kaedan Krafts. Meagan did an amazing job of taking my questionnaire responses & turning them into her own phrases....just love how she did that. Thanks Meagan! Be sure to visit her Etsy shop for the most spectacular handcrafted tutu skirts! Check out my secrets HERE. **UPDATE on 4/14** This beauty sold in an hour, yahoo! I will definitely be doing this more often. Get the details HERE. Ready, set go! This fabulous bracelet named "Love You" is comprised of polymer clay rounds with incredible detail in roses, love lettering & hearts...design is on BOTH sides! I absolutely love the pink & red pinstriped edge. Swarovski crystals in Indian Pink and Chrysalis flank handcrafted pink glass disks. Sterling silver toggle clasp and 3 sweet crystal dangles top off the love theme. Terrific Mother's Day gift or "just because" you love someone gift. 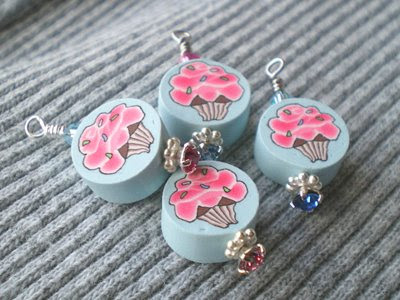 My second announcement is a HUGE 20% off sale on ALL my cupcake jewelry in my Etsy shop...click HERE to see them all. The sale won't last long so make your move quick. 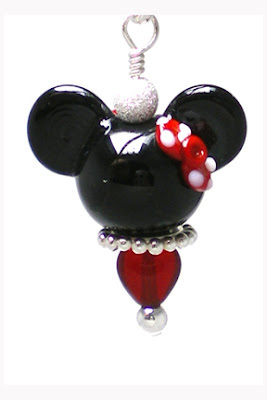 A Minnie message today...just listed the "I Heart Minnie Classic Lampwork Pendant" today in my Etsy shop. 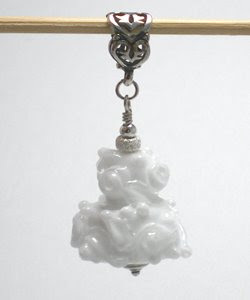 She has a small bail with a big opening so that most any cord, chain or ribbon will easily slip through. She's only $19!!! I only have 2 so snap it up quick HERE. 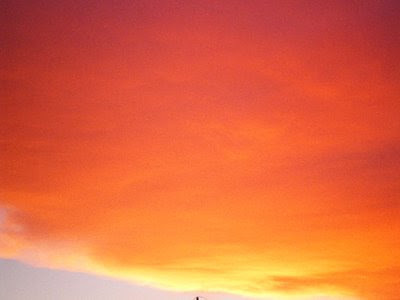 We've had incredible warm and breezy weather one day, and rain the next. Guess nature is trying to figure out spring. 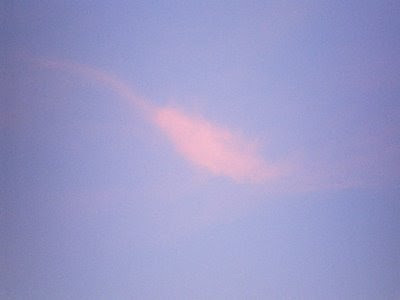 I'm just glad for the nice days when we get them. 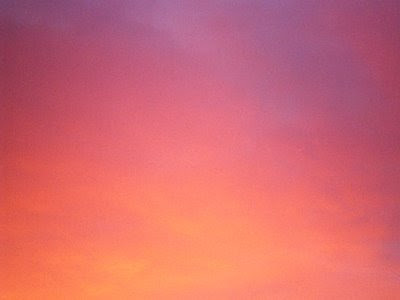 What kind of crazy weather are YOU having? Tell me where you are located too. Yahoo, it's time to celebrate our 3 prize package winners! Would you believe there were 783 prize entries??? and a big success...I had a blast! Only 4 more days to enter My First Cupcake Giveaway! It ends at midnight Pacific time this Saturday, April 4th. I just received 5 "fresh" cupcake items that will be prizes in my next giveaway...they are sweet & creamy and that's all I'm sayin'! I'm so happy about the numbers you've all helped build on this blog. There have been nearly 100 votes on the poll, over 50 followers added and my visitor counter ticked off it's 2,000 mark...yahoo! Just like on an auto motor, it's always fun to see all those fresh zeroes. How many will the next giveaway produce...hmmmm? Talk to you again on Sunday by noon to announce the 3 big prize winners...it could be you!